Providing cash flow solutions, invoice factoring, and much more to businesses throughout Chicago, Auora, Rockford, Illinois & Indianapolis, Indiana. 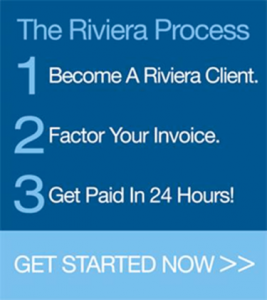 Riviera Finance is an invoice factoring company providing the following services for companies throughout Chicago, Aurora, and Rockford, Illinois as well as Indianapolis, Indiana. This company, referred to Riviera by a former satisfied client, first contacted us when they were applying for their trucking authority. By the time they were ready to start hauling, they had a list of approved customers to begin working with. Confident that with Riviera’s help they would have the cash flow needed to pay their drivers on time, they were able to start up with ten owner-operators. In their first month of business, the company billed out over $170K. Now they have more than doubled that and they are still growing rapidly. This carrier had been operating for two years when she acquired ten new trucks and additional owner operators, increasing her monthly revenue to $100,000 very quickly. With the increased business, they were overwhelmed with sending out invoices, collecting on accounts receivable, and managing cash flow. The carrier was looking for a Factor with excellent customer service, account management and non-recourse services. They chose Riviera Finance for all of these reasons, plus liked that we had a local office, online account management portal, and a local account management team designated to support their company financial needs. Because of Riviera’s quick funding on a daily basis and non-recourse factoring, the company is growing and able to take on bigger and better loads.